Retailers: Click here to find out about great merchandising opportunities and wholesale discounts on GEP publications! One of the most compact and comprehensive resources ever published, Earth: A Graphic Look at the State of the World presents essential data and commentaries on the condition of the world's environment - both natural and human. 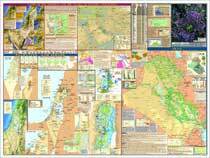 A resource for teachers, students, and citizens, The Middle East includes maps, charts, and text covering the region from India to Egypt, with special focus on Israel/Palestine and Iraq. Published in 1997, Guide to the Giza Plateau and Some Mysteries of Original Egyptian Culture remains the most comprehensive map of Egypt�s most renowned historic site. Featuring high-quality photographs of some of the planets oldest and most enigmatic artifacts accompanied by descriptive text and diagrams, Guide to the Giza Plateau is a must-have for anyone curious about the unsolved mysteries of this ancient land. "..a valuable asset to us." - Ian Woods, Publisher and Editor, "Global Outlook"
1990 "What's Happening? ", a map of south western B.C showing a partial inventory of the current environmental issues. 1991 "Native Lands Then and Now", the first published compilation of First Nations traditional territories and treaty claims in British Columbia. 1993 "The Leaf" and "Grasses", two botanical reference posters. 1994 The Knowers Ark Educational Foundation was registered as a non-profit corporation in the province of British Columbia. 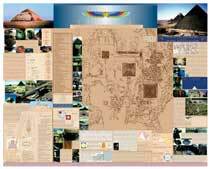 1997 "A Guide to the Giza Plateau and Some Mysteries of Original Egyptian Culture"; The Guide to the Giza Plateau was the first publicly available to-scale plan map of the Giza Plateau showing all of the excavated sites around the great pyramids. 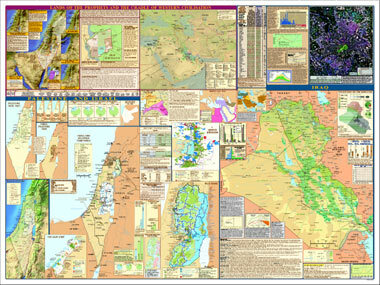 1997"Giza on Line", an online resource guide associated with the paper poster/map. 1998 "Y2K Wake Up" collated publicly available data available as of December 1998 on the challenges of the year 2000 crossover and the extent and consequences of the world's dependency on electricity, telecommunications and computer systems. 1999 "Creative Culture and the Community Ark", a world satellite map and resource inventory of the aspects of sustainable culture. 2002 "The Middle East" an overview of history, issues and current conditions. 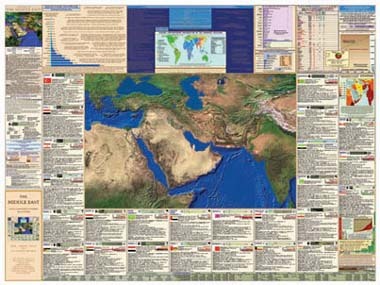 2004 "The Middle East"an expanded and updated second edition was published in March, 2004. The Global Education Project adheres to rigorous standards and strives for an impartial and comprehensive presentation of the most relevant information necessary for both accurate and adequate education in our publishing efforts. All sources are carefully chosen and cited. Charitable distribution of a large portion of each press run (usually 15%) is normal. The GEP's electronic publishing efforts have produced accessible web sites which now include the entire contents of the recent paper publications, with additional links, sources and downloadable briefing sheets. To fulfill our educational mandate and reach the largest possible readership, we publish both electronically and on paper � the paper posters assist thousands of people not reached by the internet and provide a coherent multi-use overview on one piece of paper for which there is no equivalent in the electronic medium. The website is needed because many internet users are not going to purchase a printed piece. For most, free access is their only access. Over 100,000 people used our website last year. Other than one small grant in 1998, the maps and websites have been funded and produced entirely through the support of volunteers, unpaid staff, friends, and sales of the affordably priced paper products.